Product Manager is the preferred place to make product or entity changes within the admin site. 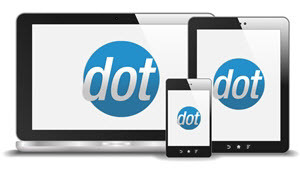 It gives quick, easy access to all of your products' and entities' properties from one screen. This area is broken up into several sections, explained below. The left-hand pane contains a tree which allows you to easily navigate to the entity or product you wish to access, or to add new products and entities. To expand a section of the tree, simply click the + sign, and the - collapses a section. Note that the location of the 'Add' links (Add Category, Add Product, Add Variant, etc) determines where the new addition will be made. For example, in the image above the 'Add Category' link immediately under "Test Cat" would create a subcategory of "Test Cat". The 'Add Category' link at the bottom of the image would create another category on the same level as "Test Cat". Within the tree, there are several important areas. 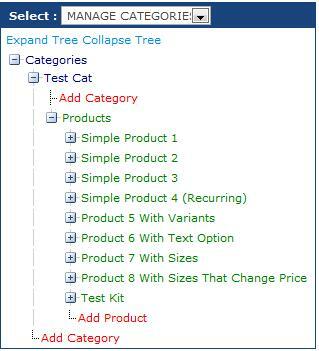 From the entity select list, you can choose which entity to base the tree on (defaults to Categories). 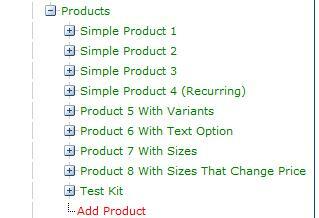 It may be necessary to change this if you have products that are not mapped to the current entity type at all. NOTE: Genres, Vectors, and Libraries are extra entities for very large sites or sites with special requirements, and require custom code to function properly. These entities do not work fully 'out of the box' and should not generally be used. The highest level of the tree is the entity level, which will display whichever entity type you choose from the select list above. Clicking a link for any of the entities will display that entity's properties in the right pane. These properties are explained in detail here. The middle level of the tree is products, which you can view by clicking the + sign next to whichever entity you wish to view the products in. Clicking a product link will display its properties in the right pane. These properties are explained in detail here. The lowest level of the tree is the variant level, which you can access by clicking the + sign on a product. Depending on the type of store, most products will only have the default 'Unnamed variant', though some may have multiple variants. Clicking a variant link will display its properties in the right pane. These properties are explained in detail here.